Dalyan, a separate town situated inside the Ortaca district in Mugla, Turkey is positioned between the well-known regions of Marmaris and Fethiye. Dalyan is about 85 km from Marmaris. Set on the south west Mediterranean coastline of Turkey, the region is renowned for its exceptional natural beauty. Dalyan in Turkish stands for ‘Fishing Lure”. The fish that swim back from the waters move up to Lake Koycegiz and lay their eggs there. As they go back to the sea, they get captured in dalyans. he region contains more than a hundred species of birds and is a breeding ground for more than 3 types of turtle like the endangered Loggerhead Caretta Caretta. The complete delta area together with the bordering town of Koycegiz and the Lake Koycegiz is declared as the “Koycegiz-Dalyan Special Environmental Protection Area” in 1988. Having a ‘Mud Bath’ on the banks of Dalyan River is among the most favored activities intended for visitors. The mud is abundant with minerals such as magnesium and sulfur which happen to be useful for enhancing skin health. There are alwo hot water springs in which you can swim. The town lies away from the coast, but visitors can have fun with the boat trips from the harbor, that features a white sand beach that is nearly 6 kilometers. 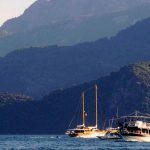 A boat ride from this point will take you to the stunning Dalyan Turtle Beach (aka Iztuzu Beach), a preservation area and one of the very last nesting locations for the endangered Loggerhead turtles. This kind of turtles have been around for more than forty five million years and hence these nesting locations are observed at close range and guarded by international preservation institutions and the Turkish authorities. Turtles lay their eggsfrom May to October and the shore stays closed between 19:00 and 8:00 to help in accomplishing this. Getting a tan and going swimming are the favorite activities for vacationers going there. The Iztuzu Beach has been declared the ‘Best open Space in Europe’ in 2008 by The Times magazine. The neighbouring massive cliffs are where you can find the ancient Lycian tombs which were created by cutting rocks during the 4th century BC. The ruins of the historical trading city of Caunos over the river can be accessed by a quick trip via a boat. It is possible to sign up for a Marmaris-Dalyan Boat Trip. The boats begin cruising from Marmaris Harbor for a 2.5 hour trip to Dalyan.